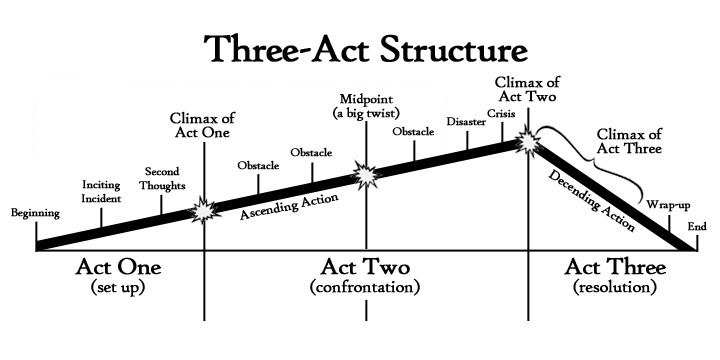 I’m not suggesting that the Three Act Structure is new to story writing–it’s been around a long time. It’s just new that I’m thinking in these terms. In my teaching and, to a lesser extent, in my own writing, I’ve always referred to “Freitag’s Triangle” map of the story arc, from inciting incident, through rising action, to the climax, followed by the resololution. This diagram has been called a “straight jacket”–fairly so, in my opinion. It’s helpful for beginners, but we have to realize that good fiction can and probably should deviate from this basic structure. My own process is more free-form, even if I may end up with a structure that looks more or less like this in the end. I have an idea and I let it live on the page as I write, until I come to an end, eventually, and then circle back in revision to clarify the plot, the characters, the themes, etc. But I am currently teaching a four-week seminar to college seniors and they have to create a story by the end of our month together. So I decided to try a bit more of a traditional approach with them. We began by talking about the three-act structure of a story and looked closely at Flannery O’Conner’s “A Good Man is Hard to Find” with that structure in mind. We identified the turning point (the Act I climax), the story’s climax, and the resolution. The assignment that I then gave them for the first week was to start their own story, through the turning point. Next week we’ll continue to the climax. Because they were doing this more intentional process for their stories, I decided I would give that a try too. A couple of days ago, I thought of a story, sketched out my three Acts very roughly, and then in an hour this morning I wrote Act I. Seriously? Yeah, seriously. And over the next week I’ll write through to the story’s climax, which I already know. The resolution is still a little fuzzy to me, but I think that will come. I wonder if this is the start of something new for me . . .
Good to think about this. I haven’t tried this as a constraint, but have tried others. Baxter’s “Request” lecture sparked a story idea that I’ve been working out. He gave the lecture at Warren Wilson and then at Breadloaf (free streaming for the latter).